In January, Governor Carney proposed a 2019 budget plan focused on investing in Delaware’s economy, in high-needs schools, and communities across our state. The governor’s budget proposal limits spending growth to 3.5 percent — an increase far below available revenue this year, and one that is sustainable over the long term. But if we hope to continue making investments that matter, we cannot continue on our current path. State spending on health care now accounts for more than 30 percent of the state’s budget. Simply put, the growth of state spending on health care crowds out investments in schools, communities, infrastructure, and our economy that would move our state forward. And this is not an issue unique to state government. 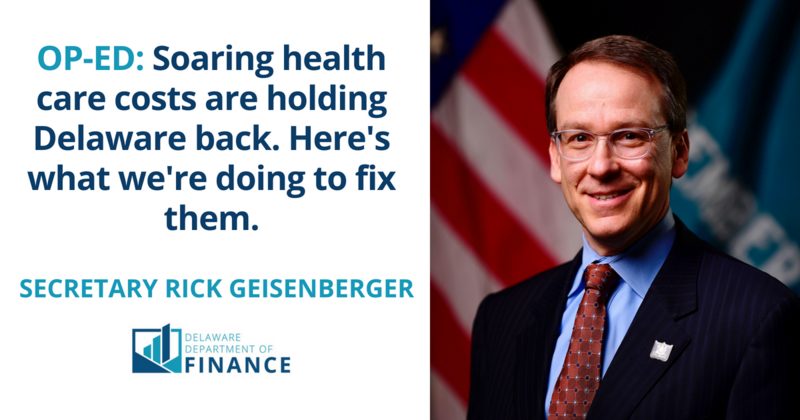 Health care spending severely strains the budgets of Delaware families and businesses up and down our state, limiting household spending and making it harder for companies to invest and create jobs. Delaware’s health care spending per person exceeds the national average by more than 27 percent. Among states, only Alaska and Massachusetts spend more. And we’re not getting our money’s worth. Delaware ranks 30th in terms of overall health quality. Workers’ contributions for health care have increased 40 percent since 2010, while Delaware wages have increased only 25 percent. Health care spending per person has increased every year since 1991, even as our economy has grown and contracted through recession and recovery. To be clear, health care is an important sector of Delaware’s economy, accounting for 12.5 percent of the state’s workforce, and thousands of jobs. But we cannot ignore concerns that health care costs are growing dramatically faster than other measures of economic growth. To address these issues last year, the General Assembly enacted and Governor Carney signed House Joint Resolution 7, authorizing the Department of Health and Social Services (DHSS) to establish a benchmark, with a growth rate for health care spending linked to growth in our overall economy. DHSS will select the methods to measure and report on the total cost of health care and identify metrics to measure and track spending and quality across our health care system. Governor Carney established the Health Care Delivery and Cost Advisory Group to assist in this process and provide feedback to DHSS Secretary Dr. Kara Odom Walker. The good news is that there is a great deal of consensus and energy about the importance of this work among Delaware’s purchasers and providers of health care services. But, understandably, some providers are concerned that, in the future, a benchmark might be used to set price controls or create spending caps on private health care spending. To be clear, this is not at all the purpose for the benchmark. Our goal is to provide additional price transparency and attention to the underlying costs and quality of health care delivery across the state. Delaware families and businesses deserve to know how much they are paying for health procedures, and what they’re getting for their money. With better information, we can analyze and report on variations in cost and quality. We can make this data available to policymakers and health care providers so that everyone better understands the sources of cost growth. Most importantly, we can use this information to work collaboratively to address unwarranted variations in costs and quality. As the state’s chief financial officer, I’m keenly aware of the importance of bending the health care cost curve to more closely align with public and private resources available to cover these costs. At the Delaware Department of Finance, we believe it’s critical that the process for setting health care benchmarks be verifiable, transparent, and independently generated. Dr. Walker already has engaged the health care community significantly in this effort and this commitment will continue. The challenge presented by the growth of health care spending is a national problem. But many solutions will need to be local. Delaware’s size — and our history of working together to solve difficult problems — means we are uniquely equipped to bring all stakeholders to the table to address this challenge. As Governor Carney has said, lowering health care costs while improving quality is the most important thing we can do for the future health of our economy, our citizens and our finances.